Genesis Double Dragon (USA) in 03:17.47 by Dimon12321. 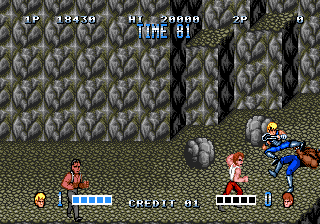 The Genesis version of Double Dragon, released by Accolade without license from Sega, is considered the most faithful port of the original arcade game. In addition, due to the more powerful hardware on the Genesis, the slowdown problems from the original 8-bit game have been fixed. In this movie, Dimon12321 kicks, punches, and whips his way through the game, making short work of any Black Warriors that dare to challenge him. For more beat 'em up action, see the run on the NES version.